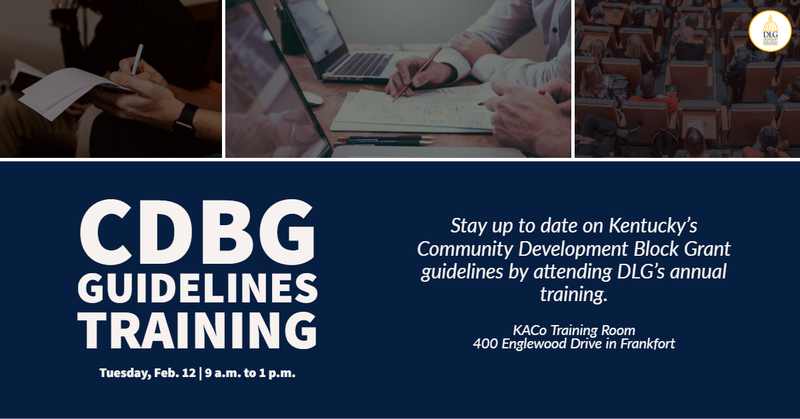 FRANKFORT, Ky. (January 16, 2019) — The 2019 Community Development Block Grant (CDBG) Program Guidelines Training will be held on Tuesday, Feb. 12 in Frankfort, Ky. at the Kentucky Association of Counties (KACo) Training Room, 400 Englewood Drive. This training will provide general information about the CDBG Program, updates/changes to the CDBG Guidelines, and the application process, as well as specific directions on how to apply. Welcome desk will open at 8:30 a.m. EST with the session starting at 9 a.m. It should conclude by 1 p.m.
State CDBG staff will be available after the training, if needed, to talk with you privately about any project questions you may have. You should contact staff beforehand if you want to get on their afternoon schedule. There will be two breaks but no lunch hour. This is done in case inclement weather is experienced and we can get attendees out in time for safe traveling. The closest hotels are Best Western and the Fairfield Inn. The 2019 CDBG Program Guidelines are to be reviewed by the Joint Committee of the House and Senate on State and Local Government on Feb. 6, 2019. Please go to the DLG website for a copy of those draft Guidelines after that date. We encourage you to print the Guidelines and bring them with you to training since hard copies will NOT be distributed. The revised applications forms for each program area will be posted on the DLG website after the training. DLG will provide the final agenda and a copy of the slides for note taking at the welcome table. Please sign in at the welcome table. The KACo building is located off of I-64, exit 58. Turn onto US 60 East/Versailles Road, turn right onto KY – 1681 S, and then make a right onto Duncan Pike which becomes Englewood Drive. The KACo building sits on top of the hill and has a domed roof. Follow Englewood past the KACo building into the rear parking lot. Directional signage to the lot is provided. The building does not open until 8 a.m. If you have any questions, please feel free to contact Jessica Wagoner at 502-573-2382 or jessica.wagoner@ky.gov.